ATX features an easy to use partner system, which can automatically assign co-operative settings to new trades submitted by trusted webmasters. The default settings profile that is assigned to new trade is the newtrade profile. 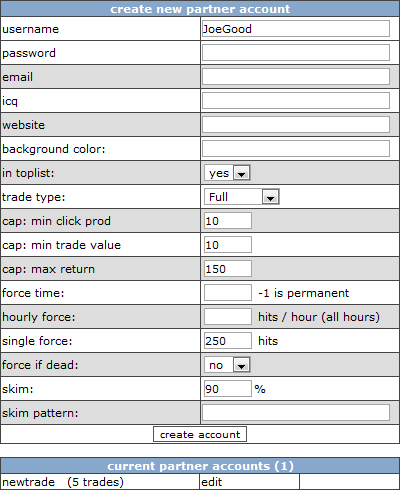 The default profile for new trade and it's settings can be changed via Trades - Signup Form. Trusted trading partners can be given their own account, with better settings, such as a strong force. the trade begins automatically with a force. This way you don't have to monitor and modify every new trade.